Representatives of over 50 advocacy groups today wound up the five-day 'Jan Sansad' here with a resolve to pressurise the government and political parties to ensure the passage of several pending legislations without ignoring people's voices in the process. The BJP today demanded for inquiry into the cases of incomplete projects pointed out by the Comptroller and Auditor General (CAG) of India in its report tabled in Parliament. The report has exposed the claims of the Congress to have developed Delhi with the help of JNNURM. The CAG has said that under the JNNURM 28 projects were to be completed in Delhi from 2005 to 2011 at the cost of thousands of crores of rupees, but only four projects have been completed. A 39-year-old woman from Goa, who posed as a British citizen, was arrested by the Delhi police for allegedly cheating businessmen by promising huge investments in their business, said a senior police official today. In the people's manifesto, released at Jantar Mantar as a countdown to the 2014 Lok Sabha elections, eminent activists and academicians, such as Babha Adhav, Mohini Giri, Aruna Roy, Medha Patkar, former Chief Justice of India Justice JS Verma, Subhashini Ali, Annie Raja, have said that the government should debate on the concerns surrounding various pending legislations, notable being anti-graft legislations such as Lokpal and Lokayukta Bill, Grievance Redressal Bill and the Whistleblower Protection Bill, then those related to land and agricultural reforms, such as Food Security Bill and the new Land Acquisition Bill and those related to women issues. "We have to put pressure on the government and ensure that Parliament functions for discussion on pending legislations for people, who are struggling everyday in their life. 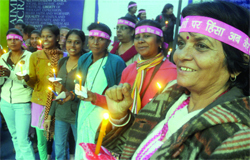 The government has to pay the heed to the concerns of people," said social activist Aruna Roy. On the Congress-led Centre's ambitious move of 'cash transfer' in various social welfare programmes from the next year which was unanimously opposed by the over 600 members of civil society organisations and people's movements, she added, people do not want cash transfer for food and PDS and even the government has been unclear about how it will implement it. Some of the key demands that emerged following the five-day engagement were: a Lokpal legislation that is accountable to the people of India and free from any interference from the government and others whose functioning is to be monitored by it; speedy and time-bound grievance redressal system and ensuring protection of whistleblowers; no forcible acquisition of agricultural lands for non-agricultural purposes, including single crop and multi-crop land and making consent of all the gram sabha members mandatory while ensuring adequate resettlement and rehabilitation benefits to be incorporated in the new land acquisition law. Further, opposing cash transfer, they also called for passage of the Food Security Act which was tabled in Parliament on December 22, 2011, without any distinction of APL and BPL for eligibility while urging the removal of the clause of making bank accounts mandatory for getting NREGA employment and keeping UID out of it. Another critical issue was that of gender and caste-based discrimination and violence and crime related that was discussed at length on the culminating day when all present sounded in one voice that the Women Reservation Bill should be passed without any dilution in 33 per cent reservation for women and Prevention of Atrocities Act should be made stringent to deter both the perpetrators of violence and crime against violence against SC/STs and those failing in ensuring justice. The BJP today demanded for inquiry into the cases of incomplete projects pointed out by the Comptroller and Auditor General (CAG) of India in its report tabled in Parliament. The report has exposed the claims of the Congress to have developed Delhi with the help of JNNURM. The CAG has said that under the JNNURM 28 projects were to be completed in Delhi from 2005 to 2011 at the cost of thousands of crores of rupees, but only four projects have been completed. President of the Delhi unit of the BJP Vijender Gupta demanded that the Centre and the Lieutenant Governor of Delhi should order an enquiry into the failure of the government to complete the works on time and the corruption committed in these projects so that the guilty might be sent behind bars. The CAG report stated that a new bridge over Yamuna near Wazirabad Barrage was to be constructed by December 17, 2011, at the cost of Rs 1,087.40 crore but only Rs 381.23 crore have been spent on this project by May 2012. In Nandnagri such bridge was to be constructed at the cost of Rs 102.86 crore by April 20, 2011, but the project has not completed even after spending Rs 108.19 crore by July 2012. Flyovers at the cost of Rs 253.22 crore were to be constructed at Africa Avenue, Aruna Asaf Ali Road, Vivekanand Marg, Purvi Marg by February 2009, but these have not been completed as yet. Similarly, the progress work of flyovers at GT Road and Road number 56 Apsara Border is very slow. Sandeep Goel, JCP (Economic Offences Wing), said that Theresa Jovita D'Souza, alias Rhea Jannet Mallon was arrested from Capital Residency, Paharganj. P. Rahmatullah, a resident of Kurnool, Andhra Pradesh ,who runs a business of granite stone, reported that in July 2012, he was contacted with Johnson Mallon, who claimed to be a British citizen, through e-mails said Goel. "Showing interest in becoming his business partner in India, Jovita D'Souza, along with Johnson Mallon, met Rahmatullah's sons in Hotel Ashok in New Delhi where she introduced herself as Rhea Jannet Mallon, wife of Johnson Mallon, and both of them claimed themselves to be British citizens," Goel added. The police said that they promised huge investments in their business. The accused told the complainants that theirs $ 8,00,000 (over Rs 4 crore) was stuck in the IMF and sought Rs 10 lakh from the complainant for the clearance the money. "The complainant transferred Rs 9 lakh on two different occasions in two bank accounts as told by the accused. He also received phone calls purportedly from the RBI, New Delhi, asking him to transfer another Rs 1.20 lakh for further clearance. At this, the complainant got suspicious and verified the authenticity of the e-mails. During investigation, the accused revealed that she is an Indian citizen and used to do odd jobs in Goa and Mumbai.